Welcome to our Guide on how to use the EVOD Vaporizer! 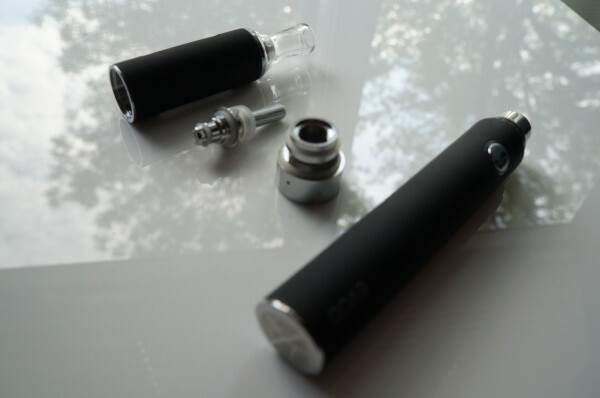 We’re going to show you how to use the EVOD Vaporizer and how the individual parts work. What Is The EVOD Vaporizer? The EVOD Vaporizer is an eLiquid only vaporizer that comes with two eLiquid vaporizing pens per box. Lets take a look at how it works. From Top Left to Bottom Right, The Mouthpiece connected to the Liquid Body, Coil unit, Battery Connection, and the Battery. Mouthpiece – This is where your mouth goes. Nothing special here. Liquid Tank – Your eLiquid goes in here. Coil Unit – This part is normally hidden inside the Liquid Tank, it contains the heating coil that will be vaporizing the eLiquid. Battery Connection – This ring will hold the coil and connect to the battery. Battery – This piece will power on and off your EVOD Vaporizer. For first time users, one of the more confusing parts of using a vaporizer is usually turning it on. The EVOD Vaporizer is turned on or off but pressing the silver button located on the battery 5 consecutive times. You then hold the silver button again to start the vaporization process. Why is this the method of turning on a vaporizer? For one, it’s a safety feature to make sure you aren’t using it while it’s in your pocket or wasting the battery by just having it on. Second, it allows the vaporizer to reach higher temperatures for a better vaporizing experience. First thing you’ll need to do is remove the Liquid Tank from the Battery Connection. You’ll do that by turning the Liquid Tank counterclockwise to the battery. 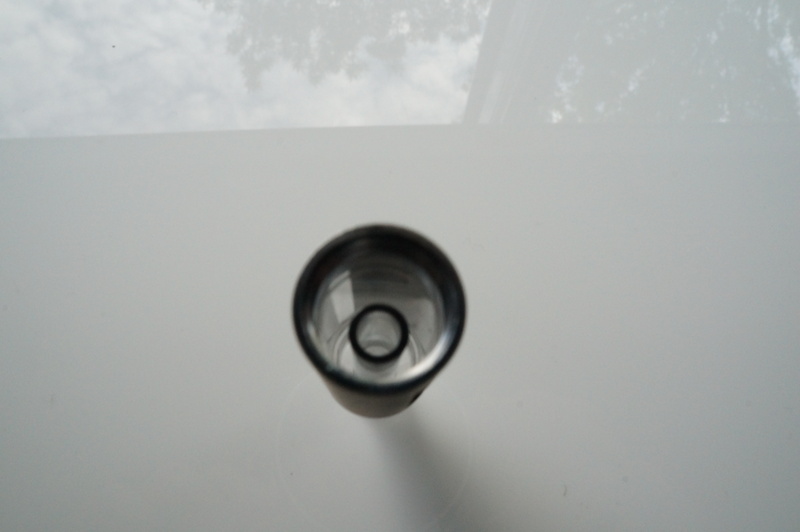 Once It’s open, you should see a hole in the center (shown below) that leads to the mouthpiece. You’ll be placing your eLiquid around the center tube, otherwise the eLiquid will come right out of the mouthpiece. Don’t overfill it, you want to make sure that the eLiquid doesn’t go above the tube. Once your done, flip the Battery part you detached earlier and reattach it to the Liquid Tank by lining up the Coil Unit to the inner tube inside the Liquid Tank. The Tube in the center of the Liquid Body leads straight into the mouthpiece. Next, just turn on the EVOD Vaporizer, hold down the silver button, and put the mouthpiece to your mouth and pull. Your vaporizer should be working now and vaping should come easily. Thanks For Reading Our Guide On How To Use The EVOD Vaporizer! THANK YOU VERY MUCH. I DIDN”T KNOW HOW TO TURN IT ON. I charged my vape last night for over 4 hours and I started using it this morning and after about 20 minutes the light would start flashing and it wouldn’t hit. I assumed it was dead and put it on the charger but the charger is still indicating it’s green. Not sure what the problem is. Is there something else I should do? Hi Alex, the problem could be the coil, we suggest replacing it. After I turn my pen on, I try to inhale and it just blinks? Is it dying? Hey Cristina, could be several reasons but probably the problem could be the coil, we suggest replacing it. 2. The centre pin has been pushed too far down into the battery. This is not always caused by overtightening, it can get sticky with juice. Try lifting it with tweezers. 3. Occasionally a build up of juice in the 510 socket or on the battery contacts can congeal, preventing proper electrical contact. Thank you for your response..however I don’t think it could be any build up of juice as this was my first cartridge and there is still juice left in it..I’ve only had the pen for two weeks..my question is how do I undo the top to get at the battery contacts..what kind of tool can I use ? Hi I have a KangerTech and I just bought a new cartridge. The cartridge works with other vape pens but not for mine. The vape pen does work with my old empty cartridge still. Any ideas? There is a small pin on the bottom of every tank that makes contact with a pin where you screw on the tanks.Take a small flathead screwdriver and push the pin on your tank from a couple of sides to move it up like a mm or so then try again. Battery is fully charged. light is green when connected to charger. press the button 5 times and still not turning on. How do i resolve this? 5-Click Protection: Allows you to turn the battery on or off for storage without accidently activating. Mode OFF when you press the button no lights will display. I can’t remembe which color is high voltage and which is low voltage. Medium seems obvious. Mine has red blue and then half and half. how long does this tank last before it needs to be replaced? After a week or so of use, you might start to notice your EVOD acting a little strange such as having a burnt taste or just not producing vapor like it did in the beginning. This is completely normal and is only a sign that your atomizer needs to be changed soon. Things such as how hard you inhale, how long you inhale for and what kind of e liquid you are using can all affect how long the atomizer will last. For example, a highly sweetened e liquid will make the atomizer go bad faster than a subtle and mellow flavor; this is because the sweetener gets caramelized onto the wick material and the coil inside the atomizer preventing it to vaporize as efficiently as it once did. 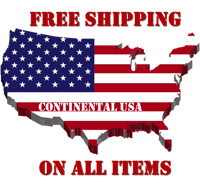 If you need to purchase some more atomizers, visit our online vape shop. Is there a requirement for the vape juice you use? How long do I charge my vape pen for the first time? How do I know when it needs to be recharged?When recharging how long do I need to charge? Charging time: 2.5-3.5 hours The battery will flash 3 times and turn off when attached to the charger. When the battery is fully charged, the LED on the USB charger will turn from red to green. Needs to be recharged when you press the power button and the light keeps flashing. I bought a puff eVOD revolution series only came with one pen and HDMI charger nothing more. Not my issue tho. Your suppose to turn on by pressing button 5 times then when vapeing hold button to hit. Well I do start hitting and it just stops flowing on own and don’t get hardly any vape at all. No instructions in box and nothing helpful on internet for this specific puff vape pen not even on the website. So how do I get it to hit bigger and stop it from stopping flow of vape on it’s own. It’s fully charged. Hi Kat, unfortunately we do not have that vaporizer model in our online store, take it to the store where you bought the product maybe they can give some advice, but probably as you describe, the problem could be the coil, we suggest replacing it. Ok my battery is charged pushed the button 5 times push again draw in nothing happens what is the problem ? Skip you need to hold the button while you inhale other wise it will not work. This has saved my life trying to quit smoking, haven’t bought a pack in a week and am slowly weenie off the vape as well!!! Thank you for the crash course. ? I accidentally overfilled it. So what do I do now? Also mine looks just like ur picture but only has 3 pieces, mouth piece & tank, the silver 3rd piece u show & the battery, pack says EVOD only had one in it.